This is an analysis about potential triggers of the next global financial crisis. I am aware of Paul Samuelson’s dictum that “the stock market has called nine of the last five recessions”, and that it can just as well take another 80 years before we are hit again. 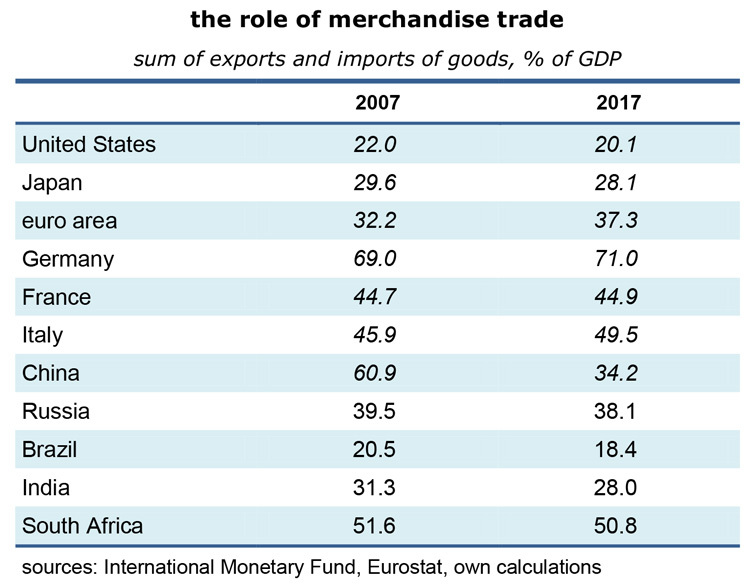 But market participants have clearly the impression that important parts of the world economy are rather fragile, nine years into the present expansion. Relative prices of labor and capital mostly do not make sense and need to be corrected. It is worth looking at the arguments. You may not realize how far stocks and bonds are removed from the underlying economy these days. Between the first quarter of 2009, when the recession was deepest, to the first quarter of 2018, the main German stock index rose no less than 217 percent while nominal GDP was up only 37.4 percent over those nine years. The same in the US: S&P 500 +238 percent, nominal GDP +38.7. These huge discrepancies look, and are, not sustainable. Investors are understandably nervous and ready to sell on short notice, but where can they turn? 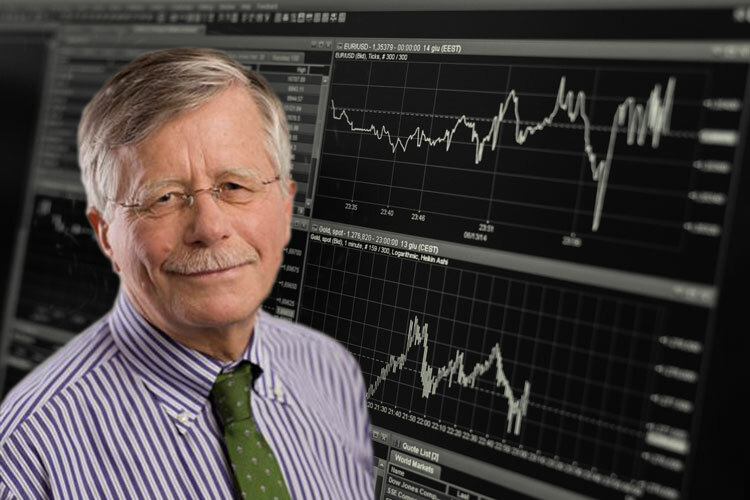 Money market instruments, especially American ones, are a plausible alternative because of their slightly positive real yields, while the euro area’s negative rates – and the prospect that the ECB will keep them there for another year, or more – are a powerful deterrent. Bonds are also overpriced. Take 10-year German governments: they yield 0.44%, compared to an actual as well as an expected inflation rate of almost 2 percent. Any “normalization” of policy rates by the ECB would probably shift up the entire yield curve which will lead to large write-downs. If yields rise to a “normal” 3½% one day, capital losses will be in the order of 30 percent. Even though 10-year US Treasuries are more attractive at 2.95%, they will also suffer capital losses if the Fed goes ahead and raises the Funds Rate by another 150 basis points between now and the end of 2019, as has been suggested by the minutes of FOMC meetings. If US wage and price inflation remains subdued, capital losses will be moderate, but if inflation finally responds to full employment and pro-cyclical fiscal policies and rises toward 3 percent and more, a bond sell-out would follow as well. For me, this is a low-probability event, though. On balance, the safest place may be 2-year Treasuries – they yield 2.50% and will only be mildly affected by rising policy rates. 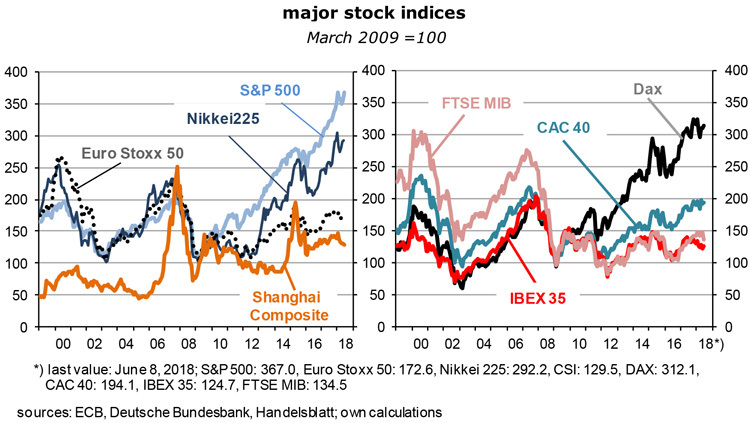 On both sides of the Atlantic, stock markets are still well supported by strong economic data. Recent forecasts by the IMF, the OECD and the EU Commission put real GDP growth at almost 3 percent in the United States and about 2¼ percent in the euro area for both 2018 and 2019. A recession is not part of the picture that these institutions paint, not least because the world economy as a whole continues to expand at about 4 percent. Emerging economies, with their high saving and investment ratios, continue to power ahead. In terms of purchasing power parity GDP they are, as a group, now significantly bigger than the OECD, the club of mostly rich countries (59 to 41 percent). At the same time, uncontrollable inflation or a new wage-price spiral are unlikely – which implies that neither the Fed nor the ECB will be forced to adopt truly restrictive policies. The “Great Moderation” has not yet ended. The best explanation for the puzzle of the persistent low-inflation environment in today’s high-growth environment is the ongoing expansion of the global labor force. Hundreds of millions of workers in poor countries continue to leave the countryside and move to the manufacturing and service centers where they compete for jobs and thus keep down wage growth. Since the integration of the world’s labor markets seems unstoppable, workers in Europe and North America are thus under pressure from their low-wage colleagues in Shenzhen and Manila and have lost their negotiating power, especially if they are low-skilled. They have to settle for modest wage hikes in exchange for some job security. Low wage inflation equals low consumer price inflation equals low policy rates in the U.S. and the euro area. The process has not yet come to an end. Given the favorable inflation outlook and, in Europe, the still sizeable output gaps, monetary policies are not expected to abort the economic expansion. What is wrong about stocks and bonds if growth is robust, inflation is low and economic policies are accommodative? The stock market rally may therefore go on some more while high-grade bonds may be weakish but not really under selling pressure. We know, though, that major corrections can occur at the best of times, when optimism reigns, simply because expected rates of earnings growth must decline at some point. Capacity constraints invariably become visible after a long expansion. In addition, the marginal return of new investments shrinks when the capital stock is already large. In a boom, it is easy to raise capital and increase debt, especially if real interest rates have been kept pro-cyclically low by central banks. Since inflation is not a risk, policy makers hesitate to take away the proverbial punch bowl. The ominous so-called Minsky moment arrives when, after a long period of prosperity, rising asset values and debt, investors are finally unable to generate the cash flow needed to service their debt. As lenders call in their loans, emergency selling starts and asset prices collapse. Because investors are aware that asset prices have been unsustainable in the first place, they will scramble for the exit and thus generate a downward spiral which can take asset prices to a very low level. In a second round, borrowers are forced to repair their balance sheets. Debts are too high relative to the shrunk market value of assets and the diminished cash flow. They will reduce debt levels by cutting down “unnecessary” expenses such as investments. In Anglo-Saxon countries in particular, they will also lay off workers. Banks get into trouble. A recession follows. The larger the previous leverage in the economy as a whole, the deeper and longer the recession. Persistent disinflation or even deflation are other likely effects – and, of course, easy monetary and fiscal policies. We have seen this in the Great Recession of the twenties of the last century, in Japan after 1989 and across the whole OECD region since 2007. 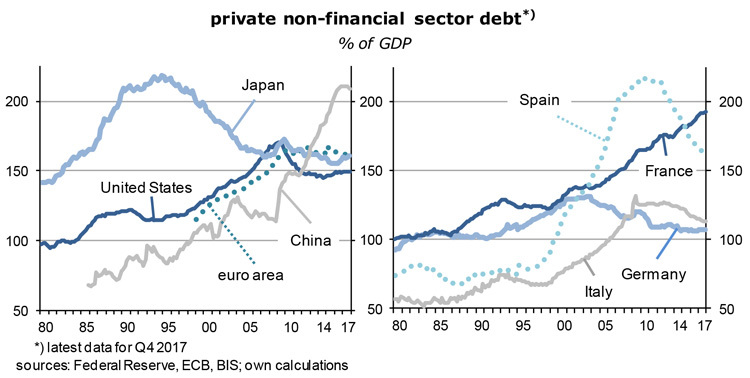 The message of the previous graph is that there has not been a significant reduction of private sector debt – relative to nominal GDP it remains almost as high as in 2007, and much higher in China and France. When the dotcom bubble burst in September 2000 – taking the S&P 500 down 47 percent over the following two years – the effects on the real economy of the U.S., the rest of the OECD and on emerging markets were limited. There had been no debt overhang which required extensive deleveraging, ie, belt tightening. The stock market correction went in parallel to a brief contraction of real GDP and did not degenerate into a financial crisis. How are the odds today? Not so good, I would say. As to emerging markets: they had weathered the last financial crisis fairly well because they had learned from the various earlier crises: in Mexico, Asia, Russia and Argentina. Debt levels were low and foreign reserves were large in 2007. This time is different, as Harvard’s Carmen Reinhard has pointed out – which could be the trigger that heralds the next global financial crisis, the trigger for which investors have been waiting. 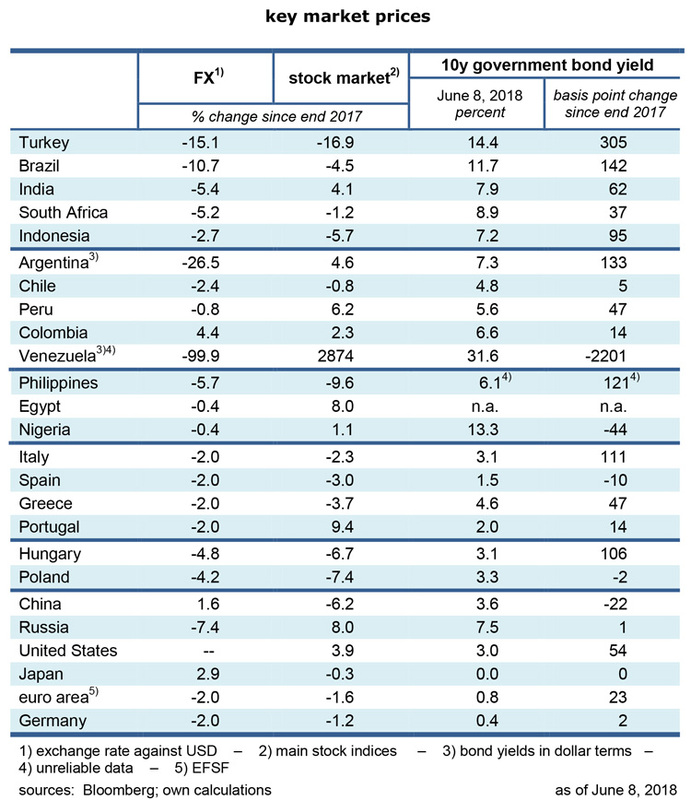 As the table on the next page shows, the currencies of large emerging economies such as Argentina, Turkey and Brazil have depreciated significantly this year. At the same time, interest rates on their debt have shot up. The foreign currency (dollar)-denominated debt of these countries is large, and they must tap international markets to get the funds to cover their current account deficits. Reinhart thinks that Argentina will not be able to find the private sector lenders it needs and would thus have to default, demand a “haircut” of its debt or turn to the IMF. In the meantime, the latter has happened: the IMF has proposed a $50bn credit line (to be approved on June 20), eleven times Argentina’s quota and the Fund’s largest stand-by loan ever. As a condition, fiscal policies have to be tightened. For the population, memories of the years after the default of 2001 come back, when the IMF medicine had pushed the unemployment rate to 22½ percent. It is 9 percent now. It took 15 years to return to international capital markets, 15 years of painful restrictive fiscal and incomes policies. Other candidates not yet mentioned that could experience debt service problems are India, Pakistan, the Philippines, Egypt, Indonesia, Mexico and South Africa: they all run current account as well as budget deficits – so-called twin deficits. Most of them are hit by a double whammy: the more expensive, ie, appreciating dollar and rising dollar interest rates. American policy and money market rates matter because of the generally short duration of those countries’ debt. Russia is not on the list of the usual suspects this time because the rouble had already depreciated from 34 to 79 to the dollar in 2014 and 2015, far beyond anything that could be justified by fundamentals, and because the high oil price has led to a current account surplus. The rouble is presently at 62 and in safe territory. For poor countries, foreign debt is an important supplement to domestic saving. It is very tempting when dollar or euro interest rates are low. Western banks which suffer from low interest margins at home are tempted to bet on the fact that returns on investment in capital-starved economies are very high and are quite eager to lend under these circumstances. They think that the mix of low funding costs, high expected returns on investment and supposedly manageable risk is acceptable and like to forget that commodity prices are volatile, that the rule of law in the borrowing country cannot always be taken for granted, that revolutions and civil wars can break out any time given the usually unfair income distribution, that the debt service can at times be suspended, especially if the ratio of foreign currency-denominated debt to GDP or exports is already high (see the table above), or that dollar interest rates can sometimes rise a lot. Around the middle of May market participants had become convinced that the Fed would raise interest rates as implicitly announced in the minutes of its policy meetings, by three further 25-basis point steps in 2018, and three more in 2019 – the U.S. economy continued to surprise on the strong side. Even though this policy might spell trouble for many emerging economies (and perhaps even the highly leveraged U.S. corporate sector), the consensus was that it was not a relevant consideration for the FOMC, the Fed’s policy-making body. “The dollar is our currency, and your problem!” – remember? For a few days, the ensuing panic in emerging economies looked like the trigger that might unleash the next global financial crisis. For now, calm has returned, but problems have certainly not gone away. They just simmer on the back burner and could come to the fore any time. The crisis has not yet spread beyond Argentina, Turkey and Brazil. The new suspected trigger of the next global financial crisis is Italy. The country has just got a new, rather strange government. It relies on a coalition of the spendthrift Five Star Movement and the xenophobic Lega. Both are euro-skeptics. Giuseppe Conte, a law professor from the University of Florence, is Italy’s fifth unelected prime minister in a row. He has succeeded to form a government that was acceptable to both parliament and president. In addition to measures against immigration, proposed policies include income support for the poorest (including an unconditional basic income), the unraveling of pension reforms and flat taxes for corporations and families, for an annual total of €100 billion in terms of lost revenues and additional spending. This is the equivalent of 5½ percent of GDP. According to the EU Commission, Italy was expected to run a government budget deficit of 1.7 percent of GDP in 2018, well below the Maastricht requirement of 3 percent. Its so-called primary balance which excludes interest payments would once again be in surplus (1.9 percent of GDP), as in almost every year since the start of the euro in 1999. The country’s balance on current account has also been in positive territory for several years (2018: 2.6 percent of GDP), which implies that foreign debt has recently been steadily reduced. Real wages and unit labor costs have increased at a significantly slower rate than in the rest of the euro area. Overall, fiscal and income policies have been very restrictive for at least the past decade. No wonder that Italians are now tired of austerity. They had accepted it because they want to keep the euro and understood that they had to comply with its rules. But after all these years of belt-tightening the successes in terms of their standard of living have been more than disappointing: unemployment is still at 11 percent, and youth unemployment is 33 percent. There has been almost no progress on this front. 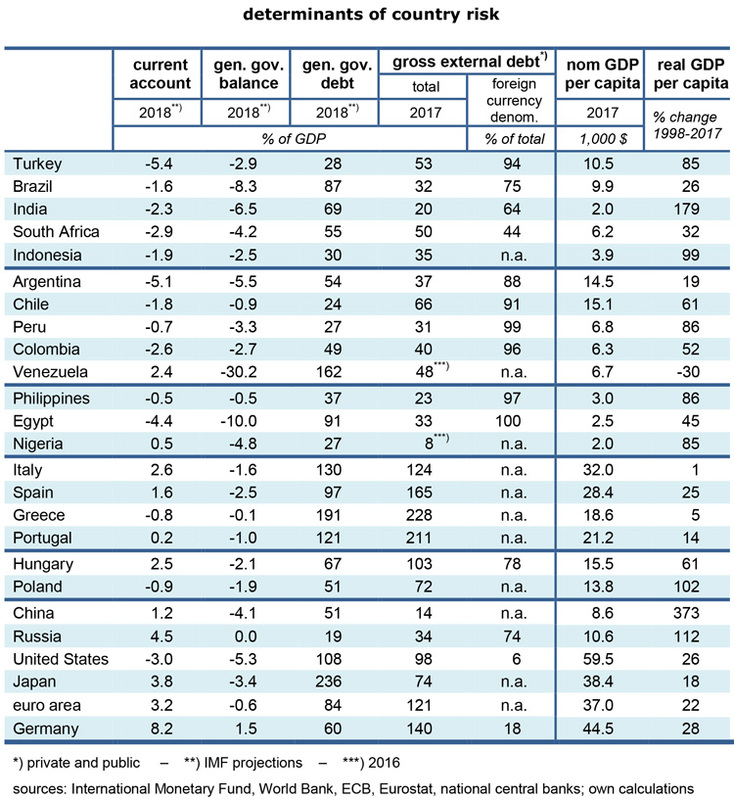 In no other euro area country except Greece has per capita GDP stagnated over the past two decades (see the previous table). Had it not been for the easy policies of the ECB, the effects on the real economy would have been even more severe. The euro is increasingly seen as the main reason for the seemingly endless years of recessions and economic stagnation. Financial markets are not convinced that Italy can carry on in the same way as in the past. They point out that the country is over-indebted and that its banks have no viable business model anymore. I agree that these are serious problems, but I also believe that with patience and some goodwill they can be managed. Italy has a political problem, not an economic one. As to the government’s gross debt of 130 percent of GDP, it is less of a threat than it seems. First of all, the Tesoro in Rome reports that the average residual life of its liablities had been 6.9 years last March, implying that it will take several years before a rate hike by the ECB will significantly increase the debt service. While interest expenditures as a percentage of GDP are expected to reach 3.6 percent, on par with Greece and Portugal, that ratio has come down from 6 percent at the start of the euro in 1999. For comparison, the United States is at 3.2 percent in 2018, Germany at 0.6 percent (says the OECD). No doubt, if Italy grew faster, the debt service would be easier, but it is manageable nonetheless. I think the fiscal boost that seems to be coming is a good thing because it stimulates domestic demand, including private consumption and capital spending, reduces after-tax income disparities, while it maintains Italy’s unit labor cost advantage, ie, its international price competitiveness. There is also nothing wrong with a likely slight acceleration of inflation which, at 1.1 percent, is among the lowest in the euro area. The huge output gap will hold down inflation in any case. And: in the end, the actual fiscal stimulus will certainly be less than the sum of the wish list of the coalition partners. 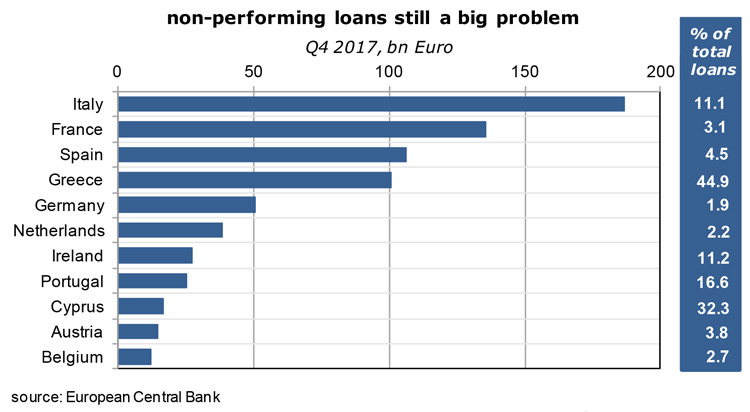 The Italian patient’s other problem that is haunting investors is non-performing loans (NPLs). As the graph – which I took from the Economist – shows, these amounted to €185 bn at the end of 2017. According to the ECB, no euro area banking sector is more exposed in absolute terms. Relative to total loans (11.1 percent), things look less scary, certainly considerably less than in Greece and somewhat less than in Portugal; Ireland’s banks are in a similar situation. Two years earlier, NPLs still stood at 16.8 percent of total loans. The remarkable progress has been achieved by securitization and openness to foreign hedge funds, the so-called vulture funds. These are mostly American firms which specialize in repossessing the collateral for secured loans. For borrowers who had speculated that they could avoid paying up, this has been quite painful, and they now put pressure on policy makers to involve courts in the process – which would improve their chances of not being held accountable. The successful outcome of this initiative could be game changing. As it is, even a share of 11.1 percent is extremely large and dangerous. It is in the same order of magnitude as banks’ equity. Germany is at 1.9 percent. If there is a new recession, perhaps in combination with higher policy rates, NPLs would rise again, together with write-downs and a reduction of capital buffers. So far, the ECB, as bank supervisor, seems to be content with what is happening in Italian banking but probably has to intervene if there is evidence that the share of NPLs stops declining. Solutions would be mergers with sound foreign banks, or nationalizations. After their share prices have fallen by about 20 percent since mid-May, both Unicredit and Intesa, the country’s largest banks, look like take-over targets. A side effect of the turmoil in Italian banking could be that the ECB will hesitate to raise interest rates. All this has shaken markets out of their previous complacency. 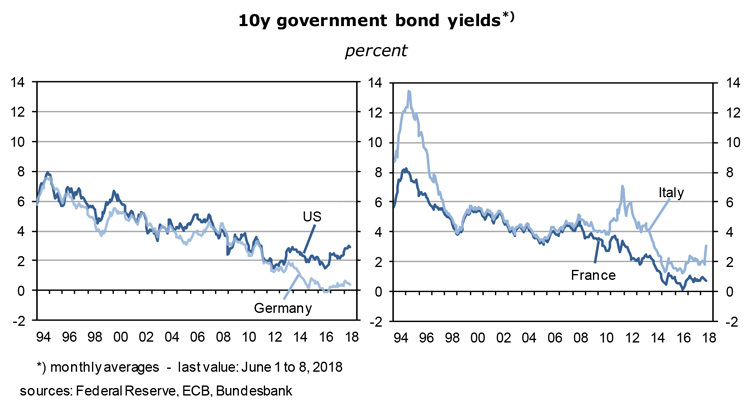 10-year government bond yields have shot up to 3.11% and are now a many-year record 267 basis points higher than Bunds. Since Mario Draghi will do whatever it takes to avoid a Lehman event inside the euro area, Italian bonds have become attractive for investors who are not too risk averse, or for carry trades. No, Italy will not leave the euro, nor will it introduce a parallel currency. The country has been on the way to fiscal soundness (although much needs to be done, such as creating an effective tax collection system). A default would mean a huge depreciation of the new lira (compared to its pre-euro level), very expensive imports, a massive (further) reduction of living standards, decades of litigations with foreign lenders, attachments of Italian assets abroad, exclusion from foreign capital markets, in short: the Argentina story. This could be the hour of the EMF, the European Monetary Fund which has been proposed by Macron. The Germans will probably go along because lending will certainly be conditional on structural reforms. But in normal circumstances, Italy is quite able to service its debt and does not need that help. It is not Greece, nor Argentina. But there is nothing wrong about another European backstop. A potentially dangerous moment for global capital markets and the real economy may arrive on June 13 if the Fed does indeed raise the Funds rate by 25 basis points (to an effective level of 1.95% or so), and on June 14 if the newly hawkish ECB announces that the quantitative easing program will be discontinued by the end of 2018. The latter would come at a time when euro area economic news is clearly deteriorating which suggests that the ECB should proceed cautiously. But euro area headline inflation has hit 1.9 percent (2.2 percent in Germany) and is thus on target (to be sure, EMU core inflation was only 1.1 in May). Another consideration for announcing less expansionary policies could be the Italian situation: if it deteriorates further, it will then be difficult for the ECB to tighten. So it may be better to move now. For me, this sounds too much like a conspiracy theory rather than a serious policy analysis. Monetary policies by the two leading central banks may surprise a little, at most, but they will not be the trigger of the next financial crisis. Since they are steady and predictable, they have been fully priced into bonds and equities. No shocks there. An escalation of the trade war launched by Donald Trump is another matter. So far, the quantities involved are small and not yet relevant for the real economy, but things could escalate once the EU and China start to retaliate. After steel and aluminum, European cars and Asian electronics could be next. As the following table shows, the integration of the main countries into the world economy differs greatly. To some extent, I can understand why American policy makers worry less about the consequences than the Europeans. Germany is much more exposed to a disruption of international production chains than any of the others. If barriers go up at the borders, firms must find new clients as well as new suppliers of their inputs. It could turn into a major structural change: the productivity shock caused by this would lead directly to a reduction of income; production would also be hit, as would be the labor market. To a lesser extent, the U.S. would also be negatively affected. No one wins in a trade war. No doubt, a sequence of new tariffs on ever more important goods from more and more countries, followed by 1 to 1 retaliation, perhaps followed by a tax war or barriers against services, can directly lead into a global recession and a collapse of asset prices. My recommendation would be not to retaliate in the first place. Let Mr Trump have his rejuvenation of the coal and manufacturing industry, sectors where markets have sent out clear messages: they are of declining importance, and keeping them alive artificially is a waste of resources that tends to reduce the standard of living (at least as far as the U.S. is concerned). Let him shoot into his foot. But a trade war, followed by recessions, could certainly be a trigger for a major financial crisis, given the precarious debt situation described above. For now, we can only sit on the sidelines, watch, hope for the best – and prepare for the worst if things escalate in earnest. How about China? In the above graph on “private non-financial sector debt”, China stands out, together with France. Debt has reached 215 percent of GDP and is thus higher than America’s debt level in 2007, at the beginning of the financial crisis, of 170 percent. And China matters. Its nominal GDP is presently about $13tr or 65 percent that of the U.S. and 82 percent that of the euro area. If nominal growth continues at the rates of the past five years, China will be as large as the U.S. in almost exactly ten years, assuming constant exchange rates. In purchasing power terms, the country is already the world’s largest – according to the IMF it is 19 percent ahead of the U.S.
Information about China is opaque. So we do not really know how much we should worry about those high debt levels. I wonder, for instance, whether the debt of state owned enterprises counts as private sector debt, in which case a large share of borrowers and lenders are the same in the final analysis, and we wouldn’t have to worry so much. It is reassuring that money market rates are just around 4.3% (“Shibor”) while 10-year bond yields are in the order of 3.7% (Swaps and CIRS). While the inverse yield curve suggests that monetary policies have a tightening bias, these rates remain considerably below the growth rate of nominal GDP which has been 6.6% y/y in the first quarter. The administration is aware of the various systemic risks and has extended macro-prudential policies to cover shadow banking, while implicit guarantees for asset managers – which had led to a booming industry – will be phased out. It seems difficult to slow the expansion of credit card and other consumer loans, though. The IMF urges China to continue deleveraging, and notes that debt levels have recently stabilized, albeit at a high level. China has the largest foreign reserves by far, low government debt and a surplus in its balance on current account (see tables on pages 5 and 6 above). Given a national saving rate of more than 40 percent, the country is not dependent on foreign lenders and can fight any conceivable financial crisis by relying on domestic resources. At the same time, capital spending has been so massive for so many years that one can expect significant pressure on marginal returns. In spite of low interest rates, there must be debt service problems in many parts of the economy. As I say in the headline of this section, China remains the great unknown. Any inside information about its economy is valuable for the outside world, and particularly for asset managers. Finally, a brief look at environmental issues. They are unlikely to play a near-term role for financial markets as a whole in the sense that they might be a trigger of a new financial meltdown on a global scale. Climate change is a catastrophe-in-waiting, but here and now other factors are more important. 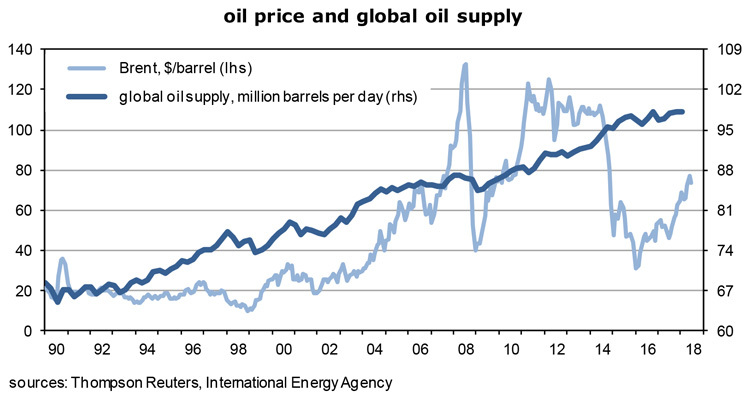 If you look at the following graph you may wonder why oil production continues to expand briskly, at about half the growth rate of global real GDP, while oil prices hold up quite well. The message is clear: since most of the oil that is lifted from the ground will be burned, CO2 emissions continue to increase and thus heat up the planet. Looking at these dynamics suggests that it is near-impossible to reach the climate targets set at the 2015 conference in Paris. 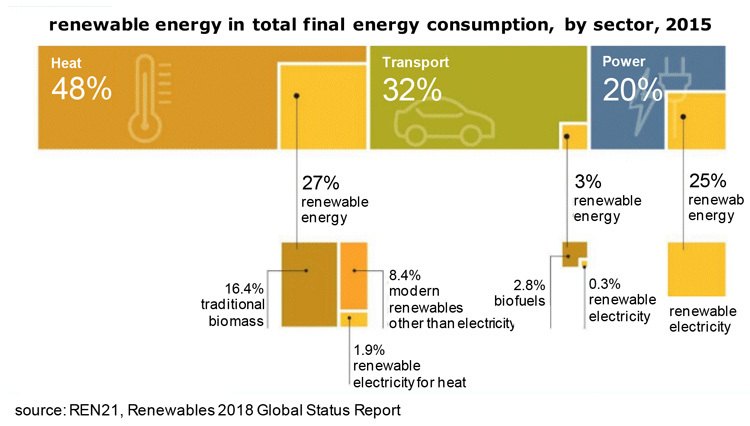 Given the steep and steady price decline of electricity from wind and, especially, solar, it is somehow surprising that the share of alternative energies in the generation of primary energy remains so low. 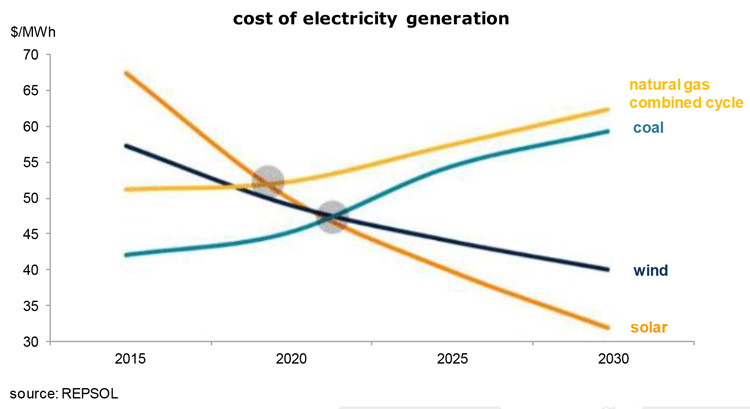 Next year, the average cost of electricity generation from solar will be on par with the generation from natural gas, and by 2022 or so it will also be cheaper than power from coal. Wind is somewhat behind, both in terms of cost reduction trends and the absolute level of the price of one megawatt hour. But it will also beat the price of electricity from gas and coal by an increasing margin as time goes by. There is no evidence that the secular cost and price reductions of the electricity production from wind mills will come to an end. In other words, investments in alternative energies should be growing at a much stronger pace. But, as the last graph shows, the share in total primary energy production is still disappointingly small whereas oil producers are riding high once again. This cannot last. The carbon bubble will burst, but not just yet. In any case, the business case for alternatives is clear even though not everybody is convinced. The German automobile club ADAC – which has 4 million members – has just found out that one in 100 car buyers will buy an electric vehicle this year. Some way to go!